Treat your guests and yourself to a decadent sweet party mix! 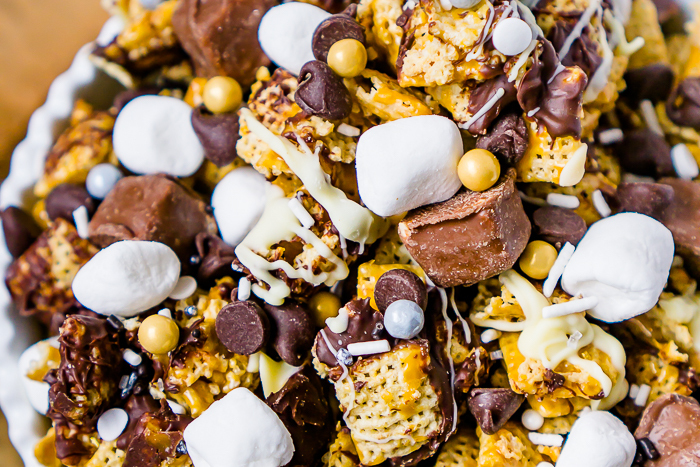 This caramel, chocolate and white chocolate party mix recipe is topped with candy bites, marshmallows and even more chocolate! Double Chocolate Caramel Snack Mix is an easy dessert recipe for any party, but it’s especially perfect as a New Year’s Eve dessert and a gold worthy Oscar’s Party with these metallic sprinkles!! This Caramel, Milk Chocolate and White Chocolate Snack Mix is an addicting party dessert! I’ve long been a fan of making easy party mix recipes for get togethers with friends because it’s so easy to toss together a few ingredients to make a snack or even sweet treat that everyone will love! In my mind, party mixes range from trail mixes to puppy chow and even sweet snack mixes which also means they range from healthy to decadent dessert mixes like this one! And I think a New Year’s Eve party and Oscar night definitely call for a decadent dessert! Until this party mix, I probably would have said my Bunny Chow recipe for Easter was my favorite, but I’m thinking this one takes the lead! 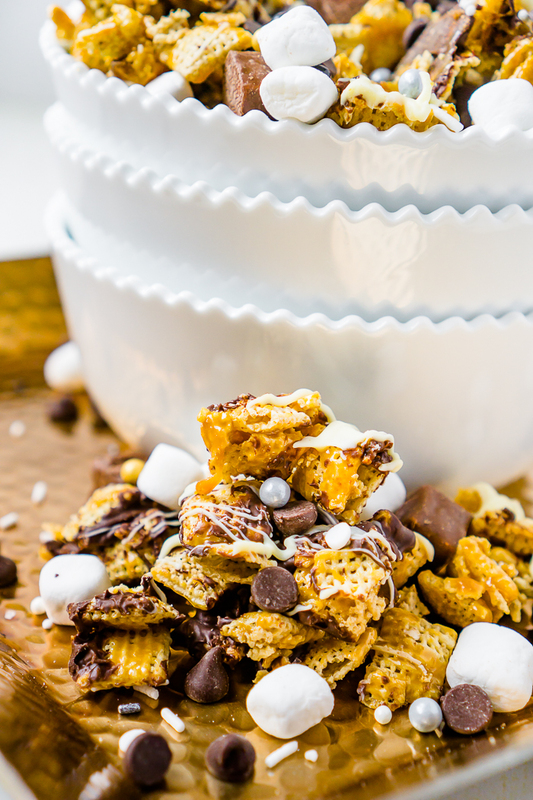 The base of snack mix recipe is a layer of Chex Mix drizzled with caramel, then drizzled with semi-sweet chocolate, and then lastly drizzled with white chocolate! That alone is enough to make your guests happy so you could definitely stop there if you were on a budget for your next party you’re planning because chocolate and caramel is definitely a year round treat in our house! But I decided to also top this snack mix with small Snickers Bites, mini marshmallows, chocolate chips and silver, white and gold sprinkles that go perfectly with ringing in the New Year. There were even some confetti sprinkles in the pack. You can easily customize for any celebration though, especially with the wide range of sprinkles that Sweets Treats Boutique offer. It’s one of my favorite sprinkle shops because she offers a wide range of options and themes with fun textures and details. Extra Large Baking Sheet – This baking sheet is so large that it doesn’t quite fit into my oven but it’s worth having in your arsenal for recipes like this! PLANNING AN OSCAR PARTY?! YOU MIGHT LIKE THESE OSCAR NIGHT IDEAS! Now Let’s Get to the Deliciously Decadent Double Chocolate Caramel Snack Mix! 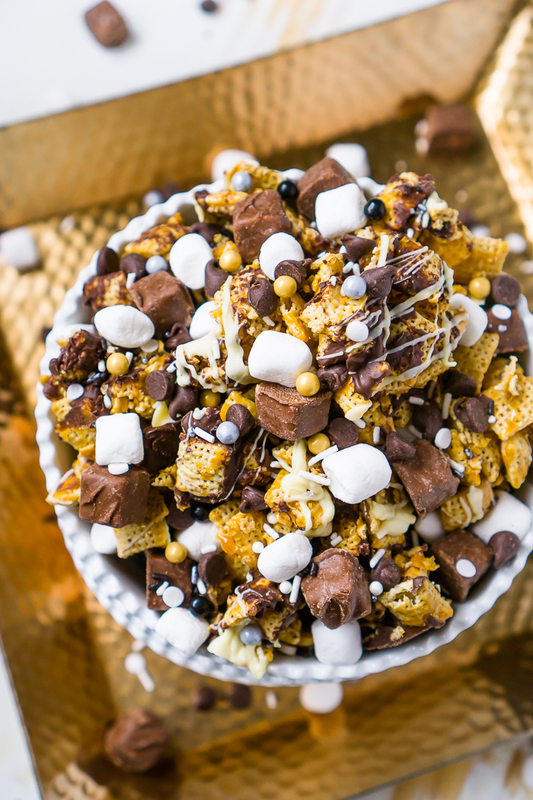 Double Chocolate Caramel Snack Mix is an easy sweet Chex party mix with caramel, chocolate, white chocolate, snickers bites, mini marshmallows and gold and silver sprinkles. Perfect party dessert for a big birthday or New Year’s Eve! Put parchment paper onto a large baking pan with edges. Lay out your Chex cereal into an even layer on pan. Separate onto multiple pans if you need to for cereal to be in single layer. Heat your caramel sauce and evenly pour over cereal. Cool 10 minutes. Note: My preferred cooling method is placing pan into fridge. Melt 1 cup of milk chocolate baking chips, being careful not to burn the chocolate. I melt in microwave safe bowl for 30 seconds at a time, stirring in between until melted. Then, even pour over cereal and allow to cool for 10 minutes. Melt 1 cup of white chocolate baking chips, being careful not to burn the chocolate. I melt in microwave safe bowl for 30 seconds at a time, stirring in between until melted. Then, even pour over cereal. If you are adding spinkles to the party mix, do so now. Then allow to cool for 10 minutes. Break the party mix into bite-sized pieces. When mixture is completely cool, add in your other toppings. This will ensure the candy or chocolate doesn't start to melt.